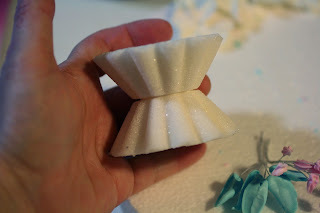 If you need a little urn or a vase for a cake topper, you can easily make one from sugar and water. The key is to use a container that's wider at the top than the bottom so that you can remove the sugar easily. You can also use this method to mold sugar into fancy shapes for a tea party. I remember my mother doing this when I was a kid, so this isn't a new thing by any means! Start with a cup of regular granulated sugar and add about 2 tsp of water. Knead the water into the sugar, adding a tiny bit more if you need to. After mixing it for a while, it should stick together and be the consistency of stiff brown sugar. Press the wet sugar into the container that you've chosen. I used some little tartlette pans, but you can use a small bowl or any other container or mold that has a larger opening at the top than at the bottom. Level off the sugar, then turn it upside down on a baking sheet covered with waxed paper and press it onto the surface. Jiggle the container a little, then carefully remove it from the sugar, which should keep its shape on the pan. if it falls apart, the sugar is probably too dry, so you should add some more water (just a little) and try again. Make enough shapes to create the containers that you want. I'm making a vase that has a top and bottom made from the little pan, so I need two of them for one vase. I did extras in case one gets damaged. Leave them to dry out for a couple of days without picking them up, then carefully pick them up to see if they're dry enough to handle. If they're not dry enough, leave them for another day or two. If you want to hollow out the center to make a bowl for flowers, take a spoon and carefully scrape out the sugar starting at the very center. This will be the softest area, so be careful when you get out toward the edges. If you put too much pressure on it, it could still crack. Turn the shapes upside down and let the top sides dry for a couple more days. When they're dry, glue the top and bottom together with some royal icing and there you have it. I made some royal icing flowers to use in this,but I need more, so that will be coming later. 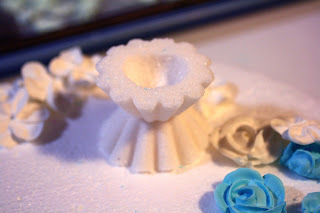 You can either use royal icing or a little styrofoam ball in the dug-out area to hold the flowers in place.